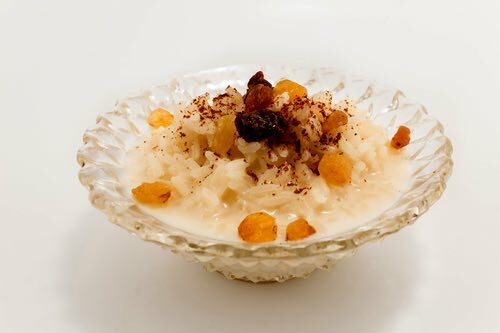 First, a little history: These easy rice pudding recipes have a long tradition dating from Medieval and Roman times, when boiled rice and milk "pottages" were associated with easy digestion and good nutrition. European-style baked dessert puddings were first made in the early 1600s. They were sometimes flavored with almonds, nutmeg, and other spices, but were not made as sweet as today's puddings. This is a delicious homemade dessert that can serve as an excellent compliment to any meal, it's economical (often called a Poor Man's Pudding), and it's good for you too. You'll love its rich, creamy taste, and it's totally delicious when topped with homemade preserves. Wash white rice and cook in double boiler with scalded milk. Meanwhile, cook brown sugar, teaspoon salt, and butter in a saucepan until mixture is syrupy, while stirring constantly. When rice is almost tender, stir in butterscotch mixture and continue cooking rice until done. Spoon rice into individual molds or dessert cups and serve cold. Wash 1 cup of rice and boil it in as little milk and water, half and half, in a rice kettle as will swell it soft. When thus cooked, add 6 well-beaten eggs, leaving out the whites of 4; butter, 3 heaping tablespoonfuls, and a little salt. Butter a tin baking-mold well and sprinkle over it finely powdered bread crumbs, or cracker crumbs, thickly at bottom and all that will adhere on the sides. Whip the whites to a stiff froth and stir in last; then pour into the mold and bake 1/2 an hour. Turn out upon a dish and serve as if it were a loaf or cake. Remarks. —I do not know who Baron Brisse is or was, but I do know his pudding is nice. It matters not what a pudding is called, but it does matter whether it is good or not when you are "called" to eat it. I will vouch for the Baron's; still I think he might have allowed 1 cup of sugar to the mixture, as the author has a "sweet tooth." Yet, it does very well without it, if served with a sauce of 1 butter to 2 sugars, whipped nicely together, and flavored with grated nutmeg or other flavor, as preferred. Soak for half an hour three tablespoons of washed rice and three tablespoons of sugar (rounded measure) in a quart of milk in a baking dish. Bake very slowly, stir up from bottom two or three times. Bake two or three hours, or till rice is soft, whole, and surrounded by a rich, creamy syrup. It should not bake dry nor be underdone. When just right it is the queen of all rice concoctions, and may be served hot with butter, or cold with cream. Boiled raisins, quartered apples, or prunes may be cooked with rice to give variety. Take one quart milk, half cup rice (boiled), four tablespoons sugar, four eggs; flavor to taste. Put milk and sugar in saucepan and let it come to a boil; then stir in the rice which has been mixed with the beaten yolk; let this boil two or three minutes; beat the whites to a froth; mix with them two tablespoons sugar; place on top of the rice, and put in the oven to brown. The following makes a delicious pudding. Stir in 2 tablespoons of rice and 1 tablespoon of sugar (more if a sweeter pudding is wished), a little nutmeg or other spice or flavoring, if desired, into a quart of milk and bake in a slow oven all morning. Stir into the milk the crust that forms on top from time to time. Raisins make a nice addition for a change, but the pudding is excellent without them. Rice Pudding, Often Called "Poor Man's Pudding"
One coffee-cup rice, two quarts milk, eight tablespoons sugar, one teaspoon salt, butter the size of an egg, melted; nutmeg to taste, cinnamon also if liked. Wash the rice and soak in one pint of the milk two hours; then add the rest of the milk, the sugar, salt, butter, spices, and also some raisins. Bake two hours, and eat cold. Three tablespoons of rice, one quart milk, one-half cup sugar, and one vanilla bean cooked in a double boiler for one hour. When cold mix well with one pint of whipped cream and four ounces of dissolved gelatin. Put this mixture into a freezer and freeze three hours. Sauce: One glass of jelly, two large tablespoons of sherry and the vanilla bean from the rice. Thicken with a little cornstarch. Always cook rice with plenty of salt; it is insipid without it. It is sometimes cooked in a steamer, with milk, without stirring it; although it is more quickly cooked by soaking it an hour or two, and then throwing it into salted boiling water in the brightest of saucepans. To half a pound of rice use about five pints of water. Let it simmer about twenty minutes. Handle it carefully, not to break the kernels. An old time custard kettle was an iron pot inside another iron pot. Instead, use a double boiler or simply place one saucepan inside another. This recipe makes one of the plainest and best puddings ever eaten. It is a success where every grain of rice seems lying in a creamy bed. Ingredients: One cupful of boiled rice (better if just cooked, and still hot), three cupfuls of milk, three-quarters of a cupful of sugar, a tablespoonful of cornstarch, two eggs; add flavoring to taste. Dissolve the cornstarch first with a little milk, and then stir in the remainder of the milk; add the yolks of the eggs and the sugar beaten together. Now put this over the fire (there is less risk of burning in a custard-kettle), and when hot add the hot rice. It will seem as if there were too much milk for the rice; but there is not. Stir it carefully until it begins to thicken like boiled custard, then take it off the fire, and add the flavoring, say, extract of lemon. Put it into a pudding dish, and place it in the oven. Now beat all the whites of the eggs to a stiff froth, and add a little sugar and flavoring. Take the pudding from the oven when colored a little, spread the froth over the top, and return it to the oven for a few minutes to give the froth a delicate coloring. Steam one-quarter of a pound of ground rice and one pint of cream a quarter of an hour, then flavor it with vanilla; add one ounce of butter, the yolks of four eggs, let it cool, and beat it for half an hour; beat up the whites of the eggs to a froth, which mix in gently. Steam it a quarter of an hour. Serve it with half a pint of boiled custard, having one ounce [melted] chocolate stirred well into it, poured into the bottom of the dish.